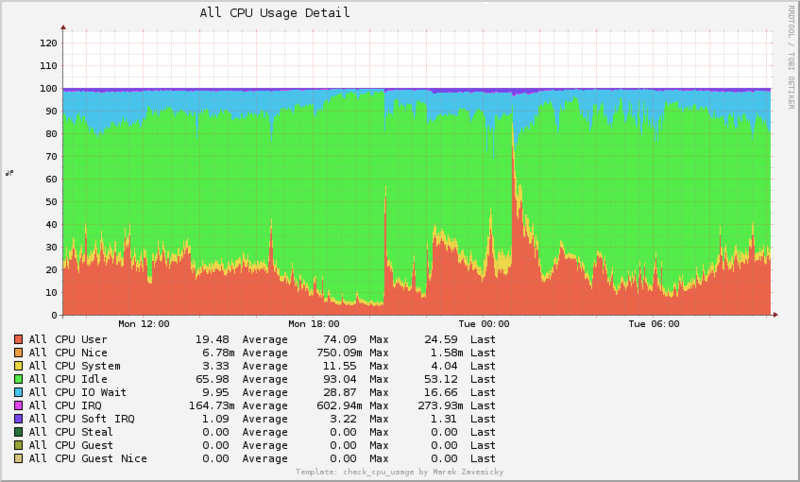 This script is intended to be an icinga, nagios or naemon plugin which measures the CPU usage in percent. By default you get the total usage of all cores but you can also measure all the cores. The php script is needed by pnp4nagios and is made for only one CPU. If you need more, extend the script to your needs. First of all, don't run this script as root. It will create a temporary file called /tmp/check_cpu_usage.gap.tmp, with the actual measures. The script comes with a help option. This nagios plugin is free software, and comes with ABSOLUTELY NO WARRANTY. General Public Licence (see http://www.fsf.org/licensing/licenses/gpl.txt). Get the total usage of all CPU's. Check the total usage of all CPU's and trigger the trespass of the defined thresholds on user, system and idle.